This comprehensive Level 3, Ofqual, first aid at work course is for people intending to act as a First Aider at Work. The course is designed to provide the First Aider with the skills necessary to give effective life support, diagnose and treat injuries or illness, and maintain care and comfort of the casualty. This course can also include AED training for those with an on-site AED. Each person will receive there own course book and on completion an A4 certificate, record of achievement and ID card certificate. 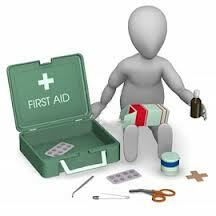 18 hours (minimum 3 days) for full initial first aid at work qualification. Why Not get a group of you..! Prices depend on number of people, location and number of days of training.